Firearm Ranges are open from 9:00 a.m. to 10:00 p.m. All ranges are open to Club members in good standing on first-come, first-served basis except when in use for a scheduled activity, or when the Club has been rented, unless permission is granted by the renter. (But in the spirit of sportsmanship, no member or group of members shall monopolize any range for an inordinate amount of time). At no time will any firearm be loaded or fired if a person is down range on any Range on Club grounds. This is a most serious violation and if verified shall be grounds for expulsion from the Club. Upon completion of the use of any Range, the person or persons using said Range shall pick up all of their empty brass and hulls. They will also pickup any targets of any type at which they were firing. Please help keep Club grounds clean. The deliberate act of throwing any firearm shall be grounds for immediate expulsion from the Club grounds and possible expulsion from Club membership upon verification by the RSO Committee. The wanton destruction of any Club property (i.e. : shooting at lights, buildings or structures) by any person or persons shall be grounds for immediate expulsion from Club grounds and/or arrest and/or expulsion from Club membership upon verification of said incident. At no time will anyone place any target direction upon, or in front of any target frame or target frame beam. Targets such as clay birds will be placed on the grounds; berms or on stakes that the shooter has brought with them. The shooter will remove said stakes when they have finished firing. 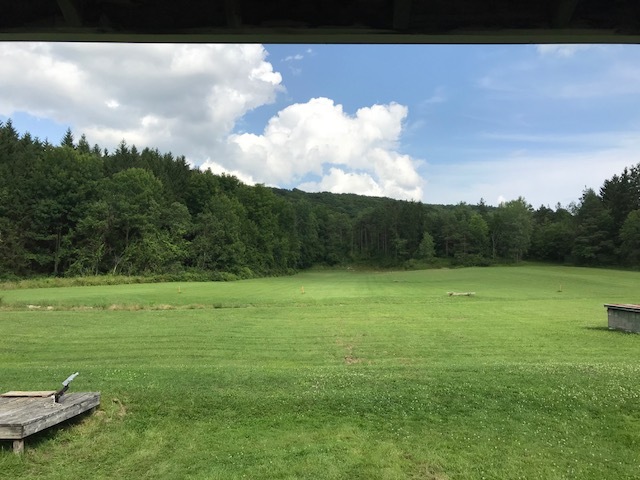 Any club member seeing any person disregarding any Range Rules should note said discrepancies and report them to the RSO Committee or a Club Official. No person shall handle any firearm that is not their personal property without permission of the owner. During Club-sanctioned·shooting events all Ranges are closed·except those being used for such events. Club rules allow each member in good standing to bring non-member guests on club grounds to use the facilities. The only exception being Club sanctioned events where the public is welcome to attend. Bring your own cardboard and 2×2 target supports. Please remove your trash from the range. Do NOT leave objects on the range. Do NOT deliberately shoot into wooden target holders! Do NOT drive on the grass unless it is 100% dry! Ask any persons suspected of not being members to show a membership card. Remember: Safety first, last and always! Off duty LEOs and members with proper FFL are not restricted to only 10-round magazines. Large amounts of tantalite are no longer to be set off on club grounds. Do it in your own backyard. We have a good relationship with our neighbors and would like to keep it that way. Always wear eye and ear protection when shooting, competing or even observing. For pistol and rifle matches, eye and ear protection is mandatory as we shoot at steel targets and steel framed holders. Do not drive vehicles on grass or ranges. During hunting seasons, be aware of hunters down range. If there are vehicles in the parking lot and you do not see anyone, assume they are down range and hunting in the woods – no shooting is allowed. You can always sight in or shoot another day. Be safe and think of the other person. If you are in the woods or hunting please leave a note in your vehicle window and raise the orange flag on the pole. Always use caution with guns and while on club grounds. Remember alcohol and guns DO NOT mix. Be respectful of others and follow all club rules.